The face is a common area where aging is first apparent. Over time, environmental elements combined with normal facial expressions cause fine lines, wrinkles, and a loss of facial volume. These conditions continue to worsen and develop into deep creases, loose folds, and sunken features, causing people to appear older than they actually are. While many individuals desire surgical procedures, such as facelifts and eyelid lifts, others are opting for cosmetic treatments through a liquid facelift. At the Wise Center for Plastic Surgery, we offer the liquid facelift procedure for patients who wish to restore a revitalized appearance to their face without the recovery time that invasive surgery requires. The liquid facelift is a cosmetic treatment that uses a combination of injectables and fillers to smooth out skin and add fullness to the face. The result is a noticeably younger looking face. As perhaps the most popular injectable in the world, BOTOX® Cosmetic treats wrinkles on the forehead, and around the eyes and lips. Derived from the protein, botulinum toxin A, BOTOX® provides a smoother appearance to the face by relaxing the facial muscles over a long period of time. Dysport® and XEOMIN® are other neurotoxin injectables that, like BOTOX®, eliminate wrinkles caused by facial contractions. The fillers that we use are made out of natural substances like hyaluronic acid and calcium hydroxylapatite, so patients do not have to worry about allergic reactions occurring after treatment. A personalized consultation will determine which areas of the face need improvement. 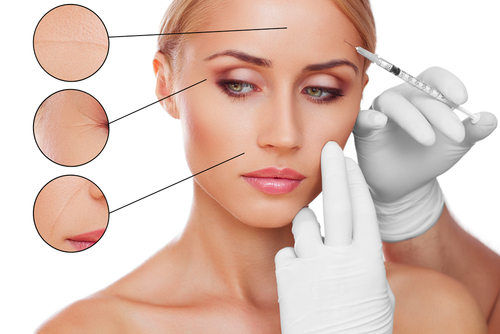 A local anesthetic is applied to numb the targeted areas of the face, and the injectables and fillers are then strategically injected. This procedure usually takes less than an hour to complete, and most patients are able to return to work immediately afterwards. The Wise Center for Plastic Surgery, in New Jersey, also offers Fat Transfer. This procedure effectively removes excess fat cells from one or more areas of the body (e.g., abdomen, hips, thighs) using liposuction. The fat cells are purified and then strategically injected into different areas of the face to add fullness and provide a younger-looking appearance.